The government is currently going through a consultancy period where they are trying to push through an NHS reform bill. Rumours abound that the Conservative Party are using this bill to open up the NHS to the private sector as compensation to private healthcare companies who donated to the Tory party during their election campaign. Health Secretary Andrew Lansley said: "Claims that we aim to privatise the NHS amount to nothing more than ludicrous scaremongering. We have made it crystal clear, time and again, that we will never, ever, privatise the NHS. 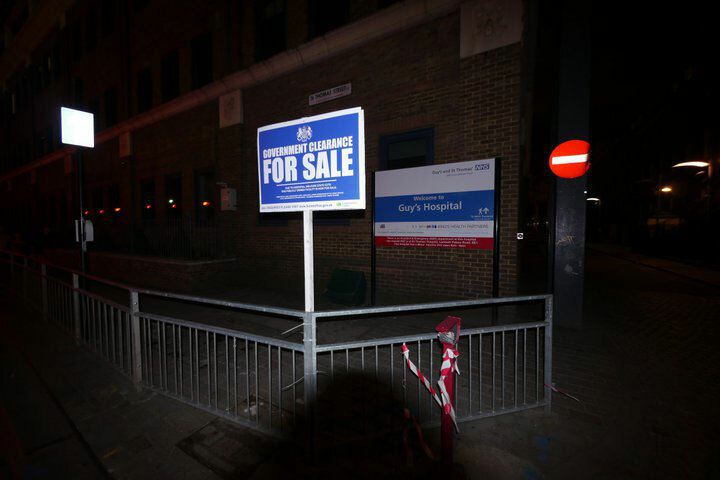 This week, emails emerged revealing that up to 20 hospitals are being earmarked to be run by foreign firms. Meanwhile, a vital legal obligation of the Secretary of State to deliver comprehensive public services across the country is being removed by, erm, the government. We, the Space Hijackers, have never trusted the government - regardless which colour tie they happen to be wearing. We’re particularly distrustful of the ones in the blue ties. While all this backroom scheming to unpick all of Nye Bevan’s good work in establishing the world’s largest single-payer healthcare system was taking place, we thought we'd take the debate to the streets. 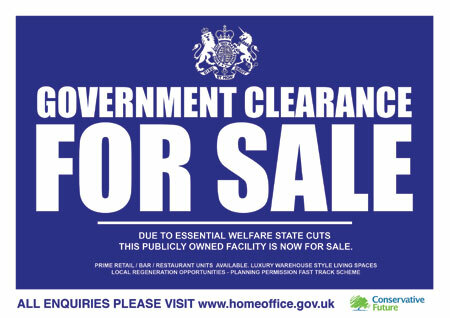 A plan was hatched during one of our monthly meetings to mock up a series of Government Clearance FOR SALE signs and sneak them up outside our hospitals, whilst they still are OUR hospitals. 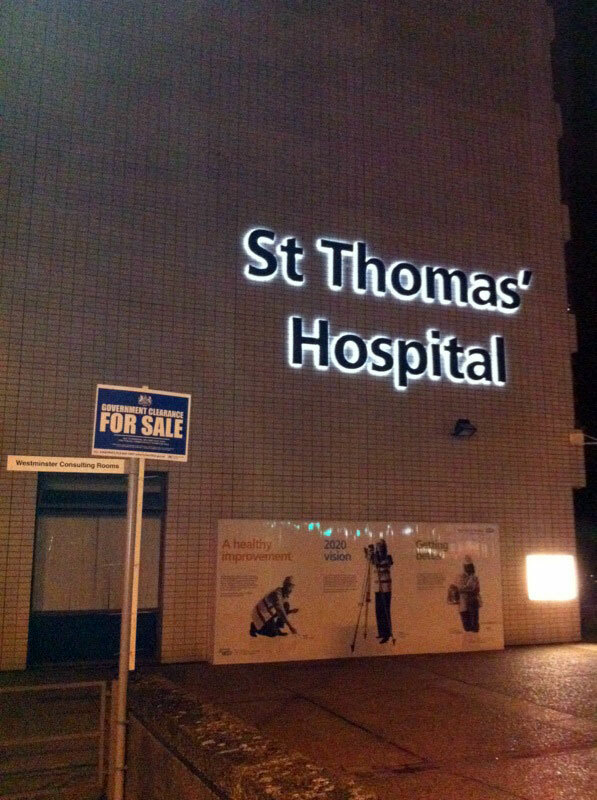 Acting as pan like agent provocateurs, we'd make out the hospitals were already for sale to jolt people into discussion about the wholesale privatisation of our health service. This would hopefully spur a public backlash (or at least spark a few thoughts towards one) before legislation has been pushed through parliament by Big Business (nb., ref., see also the Coalition Government). As luck would have it, we went out for a walk after out monthly meeting and discovered a pile of old estate agent signs dumped on a roadside. Collecting them, we dashed to our HQ and made plans to meet that weekend to turn them into our very own spoof signs. A quick bit of graphic design and a printer cartridge later, we were in full Blue Peter mode as we took the signs apart, attached our changes and hammered them back together again. Agent Jewksy met us at HQ in his car whilst the rest of us cycled over. We loaded up the signs and slipped off into the night towards our first target. The Royal London Hospital was founded in 1740 home of the Elephant Man and Edith Cavell. It produces some of the best clinical outcomes in the UK - evidenced by one of the best survival records in the NHS. 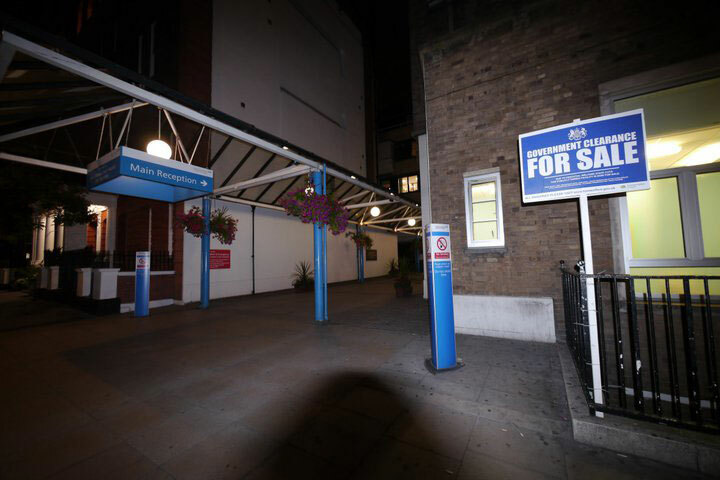 In 2008, The Royal London Hospital treated 1448 injury patients, more than any other centre in the UK. Casually strolling up to the front entrance, a team of five hijackers with cable ties in hand attached the sign to the front railings. Cloaked in the contrast of Whitechapel’s amber evening light, we slipped back into the urban camouflage. Back on our bikes, we consulted maps and hit the road again. Here, just as we were about to make our disappearing act, agent Undecided struck up conversation with a lady about the government plans. With us tugging at one of his arms so that we could melt away before being detected, he stood and entered a lively debate about how much, if any, profit making should be allowed in the health service. It seemed the signs were already, if rather awkwardly for us, stirring debate. 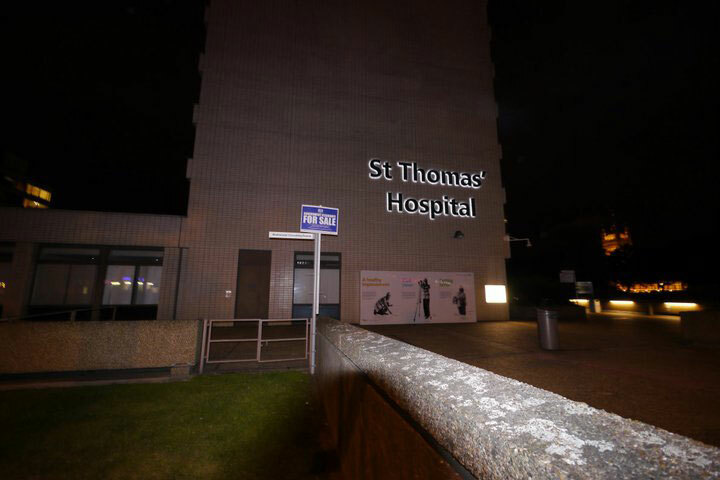 Dodging through the back streets of the South Bank we then moved on to St Thomas' Hospital overlooking parliament. It has provided health care freely or under charitable auspices since the 12th century. Not only this it also put Agent Jewsky back together (for free) after he'd brained himself on another Hijacker outing (but that's another story). Once again, just as we were about to make our great get-away, the Hijackers were caught up in another public debate about healthcare. "There are other ways to do the cuts, I wouldn't cut Education and Healthcare..." our passerby informed us. Of course, we would perhaps argue that the cuts and austerity are the results of capitalism gone amok. Instead of working for the people, the people are financing the clean-up of a mess caused by some rather un-housetrained bankers. Straddling our bicycle steeds, we rode back across the river and through Central London for our final destination. Great Ormond Street Hospital for Children. The hospital was founded on 14 February 1852 as the Hospital for Sick Children - making it the first hospital to provide in-patient beds for sick children. Despite opening with just 10 beds, it grew into the world's leading children's hospital through the patronage of Queen Victoria, counting Charles Dickens as one of its first fundraisers. Recent high profile breakthroughs include successful gene therapy for immune diseases, following a decade of research. We tip-toed to the entrance and installed our sign, stopping to pose for a quick photo by the finished piece. Next we heard laughing, a lady strolled over who'd daughter was being cared for by the hospital. 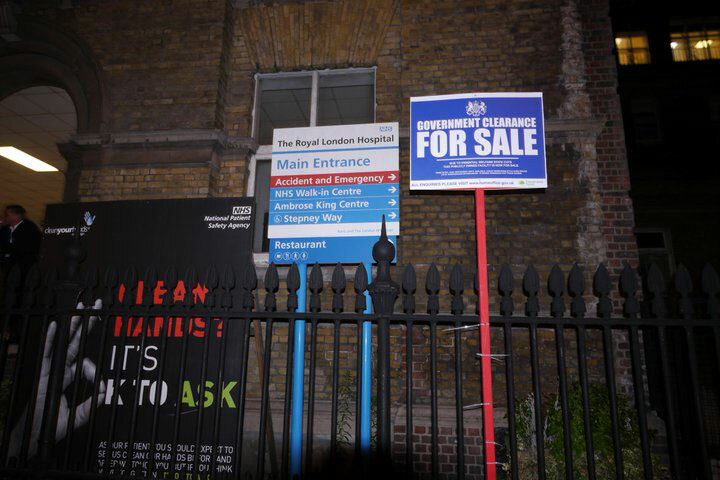 She thought the signs were brilliant and started regaling us with all sorts of info on how amazing the hospital was, and how she thought it was a crime what the Government were trying to do. Back on our bikes and back to HQ for a well earnt beer. We sincerely hope that the government doesn’t get to push through their healthcare 'reforms'. 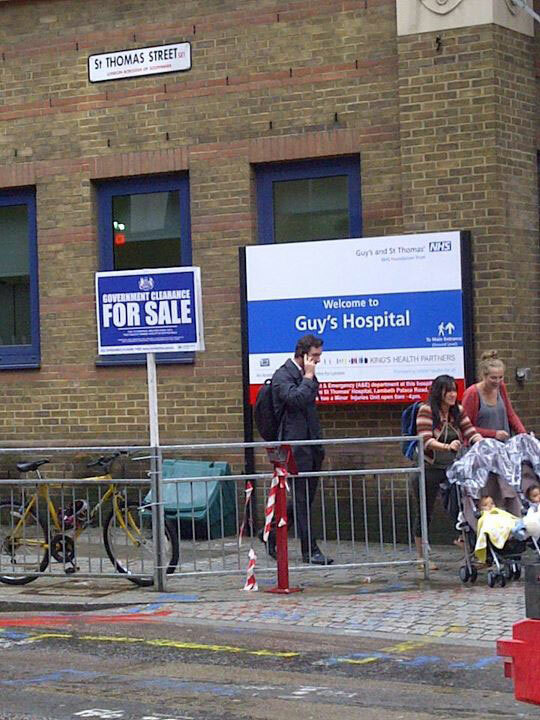 Our NHS is a national treasure, and something far too dear to be lost to market forces. Yes this may well be a case of an anarchist group supporting a state infrastructure over dismantling the state, sometimes we learn to pick our battles. Healthcare of a nation should not be seen by Government as a potential source of profit for friends in big business.